Some people have just got it, haven’t they? Magnetism I’m talking about. Meeting someone with it makes me proud to be alive and part of this wonderful universe that Willy is so excited about too in his Authentic Teaching. I’ve cheated here and used a language plant I’ve used before by Maya Angelou, but it does sum up the sentiments I wish to express here perfectly. I was visiting a school a couple of weeks ago, observing a class of eight 12-year olds with special needs who were having extra support with literacy. I was escorted to the classroom by their teacher and came across the children waiting quietly outside. They were polite, issuing timid hellos and gentle smiles with pursed lips, without wanting to hold my gaze. And then there was Annabelle-Jo. “Hello, are you Mr Warr? We’ve been expecting you. Welcome to our class. I like your tie! My name’s Annabelle-Jo by the way, but you can call me AJ. All my friends do.” Mirroring her words, she was reaching out and offering her hand in a warm welcoming gesture. “Thank you most kindly, AJ. It is a pleasure to be here,” I beamed back at her, giving her hand a good firm shake. So here’s a question for you. You’ve been invited to a party, but you’re going to know hardly anyone there. How does this make you feel? It can be daunting when you first walk in to the room, scan for friendly faces and, shock horror, not a soul you know. What to do? Well, you should read this book, First Impressions. In it, you learn how you’re not alone, how loads of us are self-conscious and worry about what others think, how embarrassed we can get about the most trifling of issues. In fact, most of us go through three predictable stages when we meet someone for the first time. Of course, some cut these stages out all together, either consciously or intuitively, and leapfrog to stage four. They’re the ones with magnetism. I see it in Cecilia’s post on Ken Wilson’s Blog about really listening to the student, and it resonates with the Dogme Challenges, including the most recent, #5, giving students a voice. So you find yourself talking to someone at TESOL France, a young man let’s say. He’s introduced himself, he seems confident and sociable, and before you know it, you find yourself at stage 1: How am I feeling about myself? Let’s take stock here. I’m still alive, that’s a start. He’s not laughing at me, that’s good. Have I got anything stuck in my teeth? Hope not. It’s all so self-conscious. It’s all so me me me. But the conversation progresses and you move on to stage 2: how do I feel about him? Do I like him? Is he interesting? Does he slurp when he drinks? You start making judgments, assessments. And if these turn out positive, then you will naturally be curious about what he thinks of you. That’s stage 3. Does he find my anecdotes amusing, my wisdom insightful, my new hairstyle chic? And that’s where most of us remain, wondering what others think of us. But stage 4! The only combination not yet explored, but the most powerful by far. As I said, you can jump straight there, and people will like you, because you have their interests at heart, you’re putting their feelings and needs before your own. You’re thinking: how do they feel about themselves? Magnetism comes in many different shapes and sizes, that’s the beauty of it, and it matches teacher roles closely. 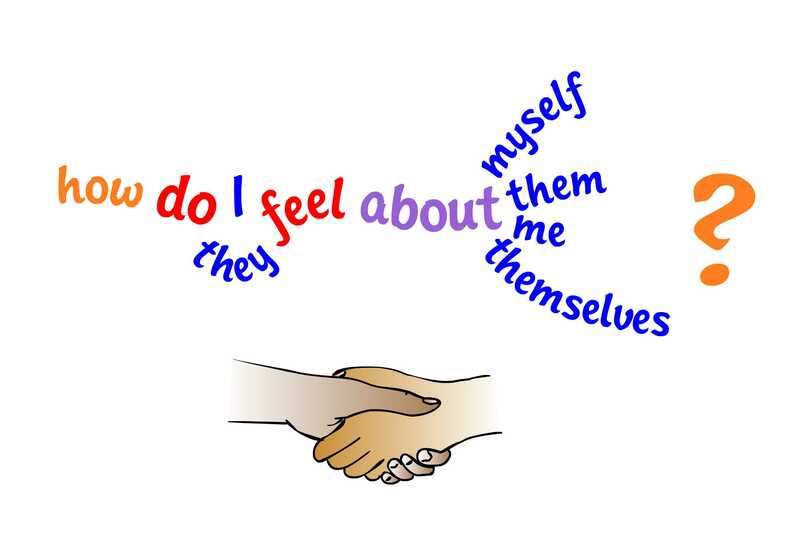 So in class, learners can feel truly valued, that their voice is heard, as they do in the delightful story at Sabrina’s Weblog. They may find they have a connection with us in some way, as all the learners seemed to get in Candy’s autumnal collection. At times, they may feel enlightened, like Willy’s doing to us with his fractals. And sometimes our learners can feel entertained, so that their spirits are raised and their worries fade. It’s simple. It’s about reaching out to others, just like Annabelle-Jo. Hi Sabrina, thanks for the comments. Let’s make the world a better place. Sounds like a good song. Completely echo Sabrina here, and thank you for including my autumn class into your reflections. As teachers, particularly of adults, who seem so much more self-conscious about using their emerging language, a very large part of our job is to make our students feel good enough to continue speaking, to continue learning and to continue trying. Hi Candy, as you may have seen, I read all your posts yesterday evening. A wonderful collection! What a lovely post! I do feel very anxious whenever I’m about to enter unknown territory 😉 The best evidence I have of this is how nervous I get before the first class with each group every semester. The phases and questions you posed resonate my feelings very thoroughly. And I was really happy to realize (and I hope I don’t sound cocky when I say this, because I am certainly not) that I’m usually really good with the 4th stage. My natural impulsive is to reach out and try to make people feel comfortable, which is one of the reasons my students always feel at ease about talking and sharing in class. Making the world a better place – I’m all up for it!!! Hi Kirsten, you are right! Just about a year ago now. Well spotted 🙂 Thank you for your kind words too, I hope you like the blog. The new webste will be ready soon too, with interactive activities, which I hope you’ll enjoy. pasted the links to the show and sent them to my celta colleagues at the time. I know next to nothing about technology in the classroom but I have so many things I’d love to do both as a teacher and as a language learner myself (incidentally, i’m learning portuguese…you wouldn’t happen to have any resources for that, too, would you? 😉 ) Would love to know more. Glad it’s been a success. I’ll put a link to this site on my blog. All the best! Some people just seem to have IT, right? It’s not about trying hard, which more often than not backfires, but it’s all about being authentic. We can’t really force others to like us, we can’t try to change who we are, and we can’t pretend to be someone else for too long. All we’re left is ourselves – and I think everyone is able to see each other’s true self sooner or later. If we’re authentic we don’t need to worry about putting up a mask every time we talk to others. You are currently reading It’s all about them at language garden.